The window for the surf contest closes at the end of the month. 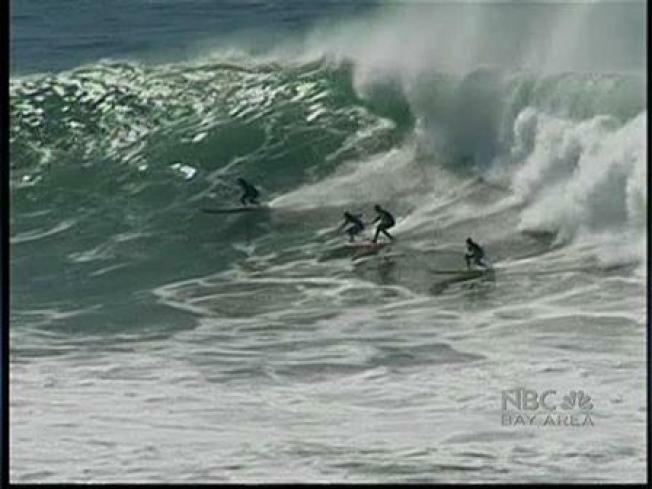 Organizers of the big-wave surfing contest at Mavericks say it's not likely that the right weather conditions will materialize in time to hold the competition this year. The window to hold the world-famous Mavericks Invitational is set to close on March 31. "Although we are hopeful, it does not look like the swell we need for the contest will show before the window closes," big-wave surfer and contest organizer Jeff Clark said in a statement. Competition spokeswoman Jessica Banks said that forecasters have not predicted any significant change in offshore conditions that would create prime big-wave swells in the next 10 days. This will be the second consecutive season that the contest was not held due to lack of waves. Organizers are now turning their attention to hosting the Mavericks Invitational Festival, which is scheduled for March 31 on the grounds of the Oceano Hotel and Spa at 270 Capistrano Road in Princeton-by-the-Sea. The festival will feature many of the 24 elite surfers who were invited to participate in the contest, as well as the inaugural Mavericks Awards, which aims to honor notable achievements in big-wave surfing over the past year. More information about the festival is available online at www.mavericksinvitational.com.